The Wildcat Trail is an orbital route around Newtonmore taking in the banks of the River Spey, open heather moorland, wooded glens and burbling streams. The Trail can either be walked as a whole or in sections as there are various paths linking the Trail to different start points in Newtonmore. The route is waymarked with a wildcat symbol, and further information can be found in the WildCat Centre on Newtonmore High Street. A waymarked trail over varied terrain including some short steep sections, but all on clear paths. Newtonmore is served by buses and trains. Newtonmore train station. Open start point in Google Maps for directions. There is limited parking near the railway station at Newtonmore - though you might wish to call at the Wildcat centre on the High Street first, where you can buy an illustrated booklet of the route. From the railway station walk back along Station Road for a very short distance past a row of railway cottages. Turn left along the side wall of the last cottage and then left again, before you reach the memorial park, to head towards the railway line. Take care crossing the level crossing and follow the Wildcat Trail signs to cross a stile onto a fenced path and then continue down a field to reach the River Spey. Here turn right, passing through a gate following the path as it skirts the river bank. In a short while the path heads inland to avoid an area prone to flooding. Soon the path passes under the railway bridge, and later, after a stile, the road bridge. There are good views of the Creag Dubh climbing crag ahead. Cross a style and then keep left by the river until a sign indicates where to bear right to avoid an area where flooding has eroded the bank - the route cuts across by a fence to reach the River Calder further on. Eventually the path climbs up to cross the road at Calder Bridge. Take the track opposite and then immediately go left - through a gate or over a stile with the Wildcat logo. Bear left to reach a second gate overlooking the River Calder once more. A good path now leads upstream by the riverbank. Banchor Cemetery can be seen on the right, the site of an early Christian sect dedicated to St Bride. Pass through a small gate and climb steeply following the narrow path. A seat part way up gives good views over the surrounding countryside. The path climbs again and then undulates across the steep banks above the River Calder as it forces its way through a narrow ravine with several small waterfalls. A path just before another seat leads down to a good spot for viewing the river, although you do have to climb back up to regain the path! Soon the path leads into more open countryside, passing through another small gate. Keep following the waymarks as the path heads away from the river uphill in a diagonal direction. Here there are good views up Glen Banchor and a seat and metal plaque showing the view. The obvious curve of the river here is how the upper glen got its name - which means a horn-shaped reach of river. Turn right when a tarmac road is reached. Soon a marker post is reached, turn left here to head into Milton Wood. The first section is larch pole plantation, although a little further in the area has been felled to allow regeneration of native species. Turn right at a sign; when the path emerges from the taller trees keep right on the main path to soon cross a stile and rejoin the tarmac road. Now turn left along it, passing a small house on the right. Soon after turn left up a track marked for Moss Cottage. Once past the buildings go through a gate and continue straight ahead on a muddy track. Ahead there are good views of the surrounding hills. Pass through birch woods and keep following the marker posts through a number of pedestrian gates. The route is a little complex but basically keeps close to the left edge of the birchwoods, with open moorland over to the left which is breeding ground for red grouse, curlews and peewits. 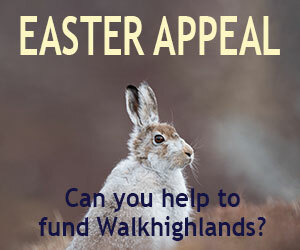 There is also the chance of seeing buzzards, deer and mountain hares. The trail crosses a number of corridors with gates on either side which have been left between sections of new plantings to allow crofters to move livestock between the upper and lower grazings. At the end of the birchwoods open ground is reached through a gate. Go straight across the track and descend to a footbridge. Cross this and follow the track briefly left until leaving it at a sign - turn right here towards a waymarker post. Here a plaque on a boulder gives information about Strone - a crofting township that once stood here. Bear left as indicated to rejoin a faint grassy track and pass through a gate. The route now descends towards the Allt Laraidh burn, passing through a kissing gate and then leading on to a new wooden footbridge. Cross this and follow the path downstream with the Allt Laraidh on your left. At one point the the path climbs high above the burn before descending once more to skirt an eroded section. The river path soon reaches the main road where you turn right into a layby and then soon up a small slope and through a kissing gate onto a narrow path through woodland. This path follows the line of the main road and then joins the pavement. Follow the pavement until opposite the first houses of Newtonmore on the other side of the road. Cross the road and follow the side track between the houses signed for the Wildcat Trail. The trail passes between two sections of the excellent Highland Folk Museum - a visit to which is free and highly recommended (the photo shows a reconstructed village within the museum). Continue straight ahead and over the railway bridge. After the bridge go through a gate and follow the path between the fence and a stream. Cross a small footbridge and turn right keeping the golf course on the right and the River Spey on the left. The route is close to the river at some points but at others cuts across grassy meadows. This area is home to herons, wagtails, sandpipers, dippers, mergansers and goosander. It is also known for its native orchids which flower between late May and June. Continue along the river until the fence which marks the end of the golf course. When the outward route is reached turn right (signed for Newtonmore) to head back to the station.